Did you know that if you are not careful, converting a single flush system to a dual flush system could actually waste more water? Using our optimal installation guide, we show you how to measure your water so that you can save the most water. 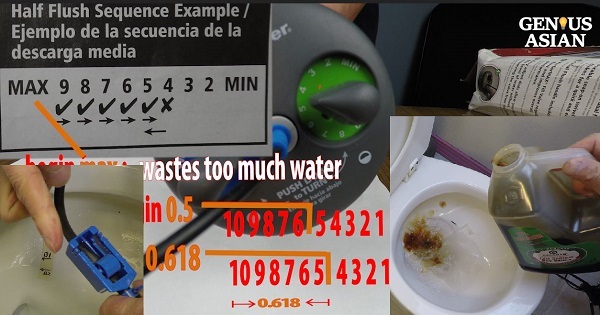 We spent a lot of time on the adjustment because if each person flushes 6 times daily, that is 2000 flushes a year per person. The installation instructions from the manufacturer aren’t the best. First, it didn’t discuss how to adjust the blue clamp on the refill valve. Second, adjustment for the half flush from this manufacturer may require you to waste too much water before finding the right point on the dial. We provide the optimal Golden Section solution to waste a minimal amount of water while testing. People who are accustomed to the single flush system may accidentally push the lever down when they intended to half flush. Since liquid waste is more frequent than solid waste, pushing down the lever by mistake would cause more water waste. In this video we provide one simple solution to swap the half dial and the full dial. This entry was posted in bathroom, life hack, plumbing and tagged conversion system, Danco, dual flush, duo flush, duo flush system duo flush installation, duo flush system toilet converter, duo flush toilet conversion kit, DUOFLUSH, duoflush syphon, FLUIDMASTER, FLUIDMASTER DUOFLUSH, full flush, golden ratio, golden section, half flush, Install, installation guide, liquid waste, minimal water, Optimal, siphon, solid waste, toilet bowl, toilet tank, wasting water on January 16, 2019 by David Zhang.